When summer finally announces itself, it is time to ensure that your Bonsai is prepared for the coming conditions. Summer in Perth, Western Australia means very little rain, hot winds, long hours of bright sunlight and increased evaporation rate. 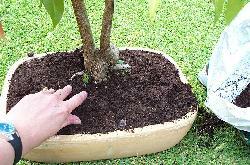 The soil in a small Bonsai pot gets very hot quickly and if not protected from the heat little roots can burn and die. A good way to prevent this is to place your Bonsai in a shaded area. Sun protection not only reduces the physical heat but decreases the Ultra Violet burning capacity too. 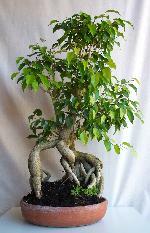 It is very beneficial to protect your Bonsai from the strong, hot winds that originate from our north eastern deserts. These winds are very nasty and stress little Bonsai leaves. They are like a hairdryer turned on all morning, drying the leaf surface. If you can, erect some shadecloth on the north eastern side of your property or sit your Bonsai amongst tall shady trees. These will help to absorb the impact of both the hot wind and the intense sunlight. We can't always be around to water our Bonsai twice a day so we need to find an alternative, such as the application of mulch to the surface of the soil. Ordinary garden mulch or manure is just fine, but choose a well composted brand. If not well composted it will continue to decompose and steal nutrition from your Bonsai soil. I prefer to use composted cow manure. You can buy this in any hardware store gardening section or nursery. It comes in a sealed plastic bag and should not smell very much at all. 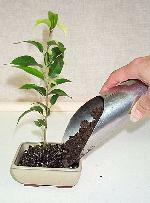 If it is rich on the nose then it is not composted and will do the same to your Bonsai as uncomposted mulch. It may even burn the roots of your Bonsai. My favourite brand is Mother Nature's Cow Manure. 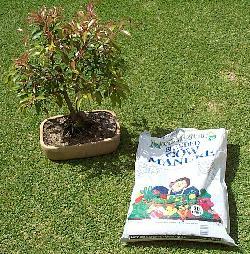 All you need to do is cake the manure on top of the soil, avoiding the trunk of your Bonsai. Leave some space between the trunk and the manure to allow the Bonsai to breathe. Water as normal and don't feed your Bonsai for several weeks. 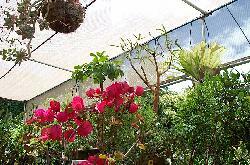 The manure will slowly seep through the soil and keep it moist, as well as feeding your Bonsai. If possible, water your Bonsai every day. Water restrictions frequently limit the amount of water we can use but you can generally always hand water using a watering can. A good, deep drink once a day is much better than fine misting for 10 minutes. 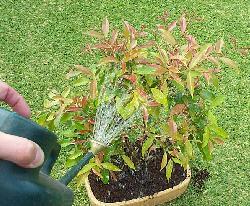 Once your Bonsai is mulched it may only need a deep watering once every two days. If you are a morning waterer, do so before the sun's heat rises. If you water at night, then after dusk is preferable. Either time is good so long as it is done regularly. I prefer to water in the morning. 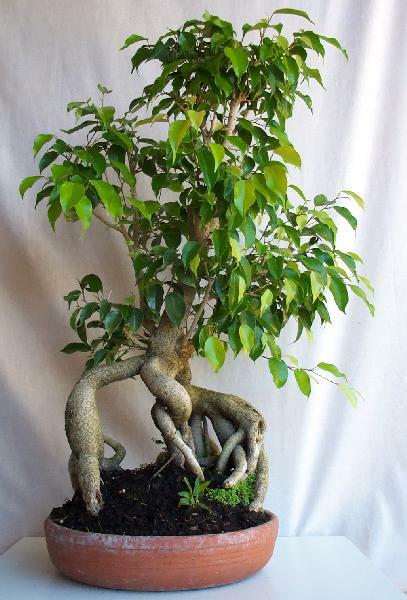 If you have a Ficus Bonsai such as a Moreton Bay Fig or Port Jackson Fig, you can sit it in a shallow saucer. This will keep the soil moist and encourage aerial root formation. If you have Conifer Bonsai such as Cypress or Pine it is best to water them once a day and mist the needles with fine spray whenever you can. Conifers tend to get very stressed in our summer heat. 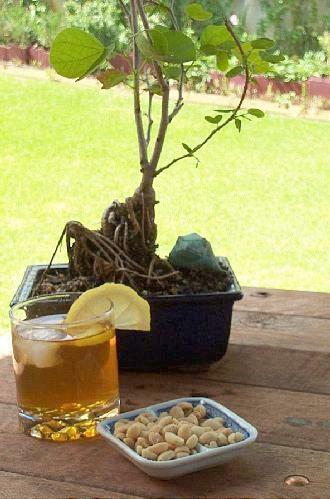 Now that your Bonsai has been mulched, moved into the shade, watered and cooled you can sit back, munch on salted peanuts, drink iced tea and enjoy the moment!